Most Galaxy Note users prefer bigger screen: when the mainstream of the screen was 3.5 inch, we already enjoyed the 5.3 inch screen! But Samsung stopped the screen size at 5.7″ since Galaxy Note 3. It is a bit annoying because most Note users do not demand one-hand operation. Anyway, Samsung finally increase the screen size to 6.3″ with a 18.5:9 aspect ratio. The physical screen area of Galaxy Note 8 increased about 10% compared to 5.7″ (16:9)ones. Galaxy Note 8 also offers more RAM compared with previous generations of Galaxy Note and Galaxy S devices. Actually, Galaxy Note 8 is the first Samsung phone with more than 4GB RAM (in China and a few markets, Samsung did offer special 6GB version of Galaxy S8/S8+). More RAM means Galaxy Note 8 should be better in multitasking. More recent apps can be cached in the RAM. Of course, the real-life performance may be another story: it depends on software optimization, app implementation and specific operations. Multi-window has been a feature Galaxy Note devices since Note II, although stock Android only added it in Android Nougat. Over the years, Samsung tried hard to improve multi window feature. In Galaxy Note 8, app pairing was added. App pairing allows you to launch two apps as a pair with one tap in split screen view. You can pre-define the pairs. As considerable Galaxy Note devices users are actively using the multi window feature, this new Galaxy Note 8 feature surely will excite some of Galaxy Note 8 owners. Please refer to this guide on how to use app pair on Galaxy Note 8 and Note 9. Another unique feature of Galaxy Note 8 is live message. Live message in Galaxy Note 8 allows you to send hand-drawn message. Instead of sending the static drawn or writing, live message creates animated version of your drawn and send it out through MMS. Of course, this is a feature of S Pen. If you do not know air command, you are wasting your S Pen. In Galaxy Note 5, for example, air command menu allows up to 5 items. You can add one app shortcut, in addition to 4 pre-installed items: action memo, smart select, screen write, and S Note. Air command in Galaxy Note 8 now allows up to 10 items. You can rotate the ring to see all options. Tap to capture is available in most Android phones. But Samsung uses the tap gesture for changing focus for rear camera. So, tap to capture is only available for Galaxy Note 8 front camera. If you find the shutter button is hard to reach, you can add a floating shutter button. The floating shutter button was first introduced in Galaxy S8 and S8+. You may check this guide on how to use floating camera shutter button. You can use the S Pen to double tap (with button pressed) the screen to launch Samsung Note and start to write a quick note. Of course, you can use widgets to take a quick note as well. But you may need to navigate to that home screen panel to use the widget. This gesture works on all screens, even when you are using other apps. What’s your favorite new features of Galaxy Note 8? 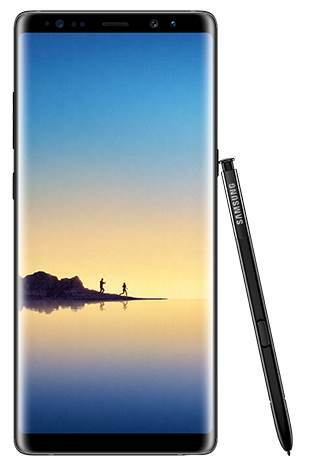 Please share your thoughts on the most exciting or interesting new features of Galaxy Note 8 in the comment box below. You can get the official Samsung Galaxy Note 8user manual (user guide) in your local language in Galaxy Note 8 user manuals page. S Note is still available on the Samsung Galaxy Apps store. Just search for it. Hi. How do we get the easy chart feature again in Note8? I lost this feature in Note8. Thanks. S Note app was removed in Galaxy Note 8. You can try to download the apk file from apkmirror.com. It should work. We will release a guide on this once we finish the test.